Where Evil wreaks its will. Guardian's magic is the key. To set the others free. The storm lashes lout at the boat fiercely, forcing the trio to sit and wait for the elements to cease battering them. After a while, the storm finally blows out, and the heroes discover that the storm has blown them into a huge lagoon, where land can be seen on three sides. Richard and Orkan begin paddling the boat while Melek starts bailing out water from the vessel. Unfortunately, the shore gets no closer, and they realize that the tide is going out and pulling them with it. The approaching thundering of cascading water signals they are approaching a seafall - a waterfall created at low tide. The craft falls off the edge of the waterfall and shatters upon impact at the bottom. The trio each grab a piece of wood from the broken boat as they go under water, even touching the seabed, before they resurface. Coughing and spluttering, they swim towards each other to regroup. That's when Melek notices and points out a boat. Although the ship appears to be in tatters, a rope ladder is hanging from the side. Richard and his friends swim up to the ship and clamber up the makeshift ladder, collapsing tiredly onto the deck. They look around and find the ship deserted, so they take the time to read from the Book of Prophecies. After reading the next verse, they suddenly hear footsteps and look up, finding the ship abruptly bustling with activity, with sailors appearing to get ready for a storm. Richard approaches the helmsman and thanks him for saving them before trying to pat his back. 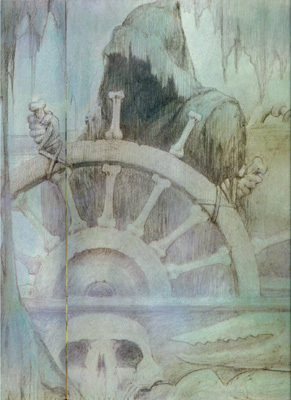 To Richard's horror, his hand passes right through the helmsman's body, and he realizes that he and his friends are on a ghost ship. A loud whistle is heard and the entire ghost crew save the helmsman disappears below deck. The helmsman then turns the ship's steering wheel, and the schooner starts to dive nose-first into the water. In a panic, Richard orders his friends to get to a large diving bell on the ship's upper deck. 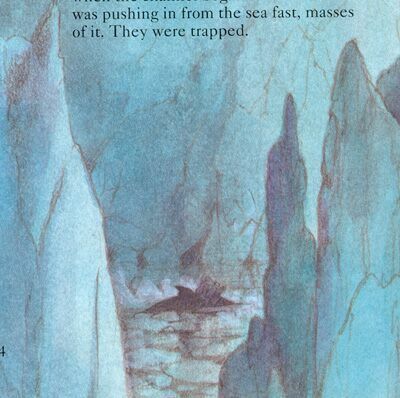 The trio open the bell and climb inside, closing it moments before the entire ship is submerged under the waves. Despite escaping drowning, the limited air supply in the bell immediately brings suffocation to mind. Looking through the bell's porthole, they watch as the ship skims across the floor of the sea through a coral maze that appeared to be more like a village than a reef. Suddenly, the ship comes to a halt and the diving bell topples off the deck and onto the sea floor. 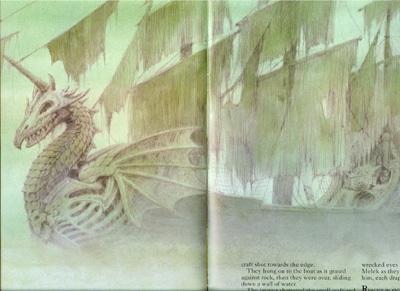 The ghost sailors disembark the ship and drag the bell across the sea floor until arriving at a large undersea palace. The bell is taken inside a large throne room adorned with sea shells and filled with strange creatures. 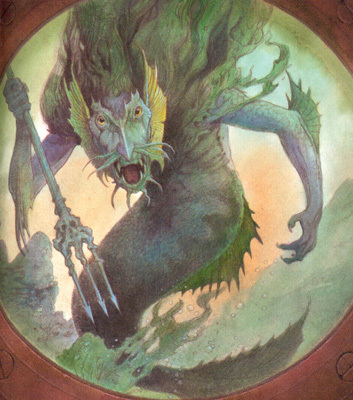 One of the creatures, a merman with a trident, approaches the bell. Melek recognizes the creature as Nemis, the Merman King, and tells his friends. The merman studies the bell's occupants and recognizes Richard as the Chosen One, proclaiming he will deliver him to the Evil One as a prize. 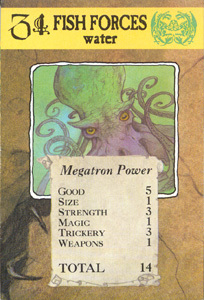 The merman asks that his prisoners in the meantime join the Guardians of the Fishes, Tishon and Shunta, and a large octopus approaches the bell to engulf it in order to entrap the three occupants. Richard sees the two Guardians entangled in a nearby net, and at that moment he hears Golan telling him to rescue the Guardians, and that he will be saved at the same time. Richard informs his companions of his decision to rescue the Guardians, and they agree. After taking a deep breath, the trio open the diving bell hatch and push forward into the ocean, their escape not noticed by Nemis or the octopus. They reach the entangled Guardians and Richard begins to hack away at the net with his dagger. Moments before has to release his breath, one of the Guardians pulls him into the net and presses a scaly mask against his face, which amazingly allows him to breathe. Two other masks are given to Melek and Orkan, and the Guardians use Richard's dagger to cut the remaining pieces of the net. But as Richard was regaining some hope, Nemis notices the escape attempt and lunges at the freed Guardians with his trident. Tishon and Shunta attack in return, but Nemis is powerful enough to drive them back. At the same time, the octopus realizes what's going on and approaches the guardians. Suddenly, a dolphin emerges from the depths and slams into the octopus, sending it sprawling. The octopus quickly forgets about the escaped Guardians and turns on its new foe, but the dolphin manages to elude its every attack. Yet the distraction of the octopus by the dolphin doesn't deter Nemis, who has the upper hand against the Guardians with his trident. Richard, remembering the prophecy, unbuckles Kika's belt and hurls it at the Merman King. The belt magically traverses through the water and wraps itself around the trident, snapping the once formidable weapon like a twig. With his power source destroyed, Nemis begins decaying. Beginning at his tail and ending at his face, his flesh strips itself from his bones until nothing but a skeleton remains of the evil creature. With Nemis dead, the sea creatures that had surrounded the throne room suddenly start flailing around happily; the merman's death had freed them from his spell. 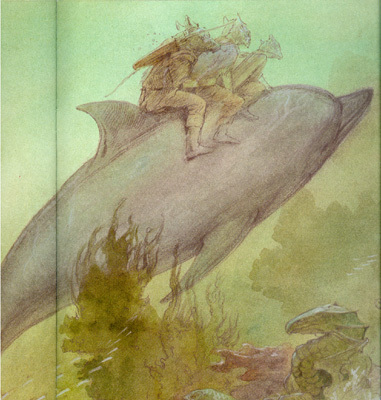 The dolphin swims up to Richard and the Guardians, where Tishon identifies the dolphin as Doonar, the last of the Sea Mammals, and a creature who has been a thorn in Nemis' side. Shunta says Doonar will return the trio to the surface, and asks where they are headed next. Richard pulls out the Path Finder for directions, and Doonar recognizes the direction as pointing towards Frigoria, a cold wasteland where his people are frozen. With the direction set, the trio climb about Doonar, but not before Shunta hands Richard a small bottle of oil that will protect them from the worst of the cold by rubbing it onto their skin. With the gift accepted, Doonar whisks the trio from the sea floor to the surface. Upon reaching the surface, the masks covering the trio's faces disintegrate into the air. Within moments, the sea grows incredibly cold with ice everywhere, and application of Shunta's oil does little to relieve the chill. Eventually, they reach enormous ice cliffs that surround them on either side. The cliff is littered with dangerous channels, and Doonar picks the widest one he can find. Unfortunately, as he carries the trio deep inside the channel, the walls around them begin to narrow as ice begins pushing in from the sea at an alarming rate, trapping them where they float. Tishon and Shunta are the Guardians of the Fishes and the Keepers of the Life Force Pod of Justice. Being twins, they are the only double-Guardians among the Keepers of the Life Force Pods. The gender of either of the two Guardians isn't known. After the final battle at the Ancestral City, the twin Guardians were captured by the Evil One and put in the care of Nemis the evil merman. Their weapons are revealed to be daggers later on in the series. 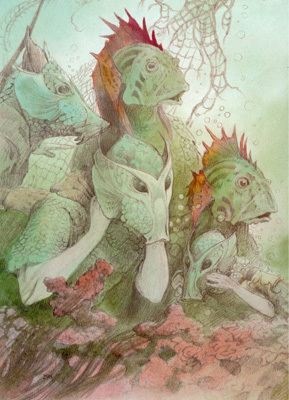 The Fish Forces are the creatures under the protection and command of Tishon and Shunta, the Guardians of the Fishes. The variety of animals that make up the Fish Forces isn't known exactly, but it is known that the Fish Forces are composed of water-breathing creatures only - sea mammals do not fall into this category. As with other Forces in the series - Insect, Reptile, etc. - the Fish Forces were under a spell cast by the Evil One and forced to do his bidding. After the death of Nemis, the Merman King, the spell was broken and the Fish Forces freed. 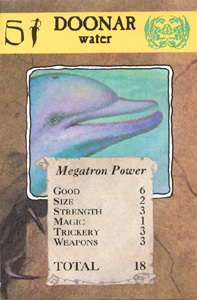 Doonar is a dolphin that dwells within the waters that fall between Tuska's island and the ice land Frigoria. When all of the sea mammals were imprisoned in Frigoria by the Evil One, Doonar escaped their fate and chose to become a thorn in the Evil One's side. 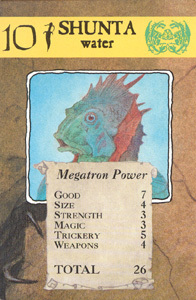 He did this by attacking Nemis, who held captive the Guardians of the Fishes and had all of the Fish Forces under his control. 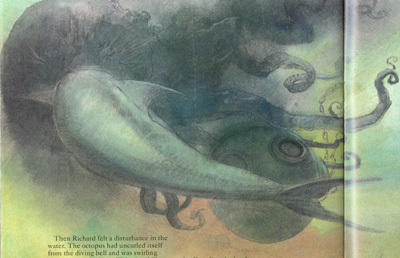 It is Doonar who manages to buy Richard enough time to save the Guardians from Nemis by distracting the octopus that otherwise would've re-captured the Guardians. 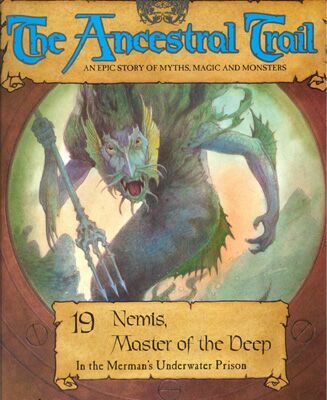 Nemis is a merman who dwells within the waters of the Ancestral World. 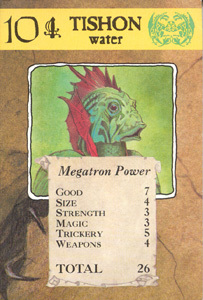 As the Evil One's leader of his water-based forces, Nemis is charged with guarding the captured Guardians of the Fishes. His weapon is a trident that not only acts as a powerful weapon but also gives him strength to face several powerful foes at once. But this trident is a double-edged sword - if broken, his power source is lost and he dies. "A vicious-looking merman holding a coral trident floated towards them. The merman swirled to a stop by the porthole and peered into the bell. His features were thin and pinched and a bony nose jutted between cold, slanting eyes. His menacing stare held them entranced before he finally spoke." Almost immediately after saving the Guardian Tuska from the previous issue, Richard and his friends decide to rescue the twin Guardians of the Fishes in issue nineteen of The Ancestral Trail. This puts the streak of found Guardians/Pods in consecutive issues at four, starting with the rescue of the Guardiand Zard in issue sixteen and including finding the Pod of Valor in issue seventeen. Only one Guardian remains to be found, along with two Life Force Pods. One thing that this issue does demonstrate quite well is that Richard, despite being the Chosen One, cannot save the Ancestral World on his own. Even with his companions Orkan and Melek, Richard still needs outside help from time to time. 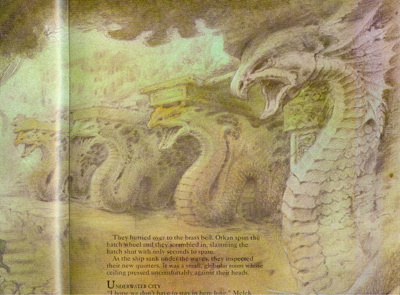 This was shown when Nemis and the giant octopus were bearing down on the Guardians, and the dolphin Doonar appeared to help them. Without Doonar's help, the Guardians would've been recaptured, and most likely Richard and his friends as well. Some people might call this a deus ex machina, but I feel it fleshes out the Ancestral World and shows that the world does not exist in a vacuum, waiting for a hero to do all of the work. Finally, you've heard about it several times before, but now you finally get to see it: the playing card that is meant to represent Nemis. 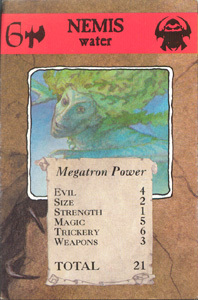 Looking at the picture in the card, it is obvious that the picture bears little resemblance to the picture used on the front cover. Whereas the card's Nemis is more human in feature (albeit in a grotesque manner), the cover version is more monstrous in form with his beast-like features. Of the two Nemises, the cover version wins over the card version easily: while the card version can be mistaken for an old man who had taken a bath for too long, the issue version looks like a creature that can kill you. "It's a ghost. We're on a ghost ship!" "I hope we don't have to say in here long. The air can't last forever." "At last! The Chosen One. I have waited for such a prize. You can join the twin Guardians of the Fishes, Tishon and Shunta, until I deliver you to the Evil One." Richard: "Where did the dolphin come from?" Tishon: "It's Doonar, last of the Sea Mammals. He managed to escape the spell that fell on the rest of his people and has been a constant thorn in Nemis's side. We were lucky he was here today." Doonar: "Then you're headed for Frigoria. It's the coldest place I know and it's also where my people are being held prisoner in walls of ice." Richard: "That's where the Path Finder directs us, so that's where we must go. Perhaps we can help your people." "Take this. It's a special oil which will protect you from the worst of the cold if you rub it into your skin. Good luck and thank you for saving us from Nemis. May you fare as well in your next encounter."